Subtitle: How to sew up edges that won't fray, even if you don't have a serger. Don't you hate it when you're trying out something new and the instructions call for some expensive tool or machine that 1) you don't already own, 2) you don't have the money to buy or 3) you wouldn't have room for even if someone gave it to you, because your craft room/closet/under-bed storage has reached its carrying capacity. Well, I may not be able to suggest an alternative to a kiln, but I can help you if you happen to be serger-less. First of all, you may actually have access to serger-like capabilities even if you don't own one. Check the owner's manual on your sewing machine. Look under the O's. Do you see the word Overcast? If you do, you've hit the jackpot. This finishes seams just like a serger. Well, close enough. When I first discovered this stitch on my machine, I called Jeff squealing, "Holy crap, do you realize that my sewing machine can make stitches that look. just. like. a. serger!?" As I believe I've mentioned before, I am easily impressed. No overcast? That's OK. You can try a French seam. It only works on straight seams that don't have any fiddley bits (as far as I've been able to figure out), but it's fairly easy. It also makes the inside of the seams actually look nice. Note- The following explanation of French Seams has the added benefit of containing a Don't Do What Donnie Don't Does. I realize we haven't had one of those in awhile. It's not because I haven't been making mistakes, but more likely because I haven't been paying attention and therefore haven't even noticed them. It's nice when I can be a cautionary tale. 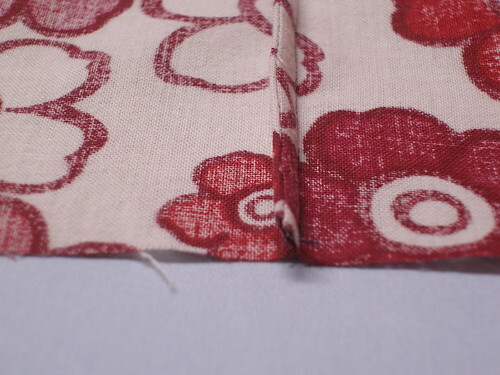 -With wrong sides facing (yes, you heard me, put the right sides out), sew a straight seam. 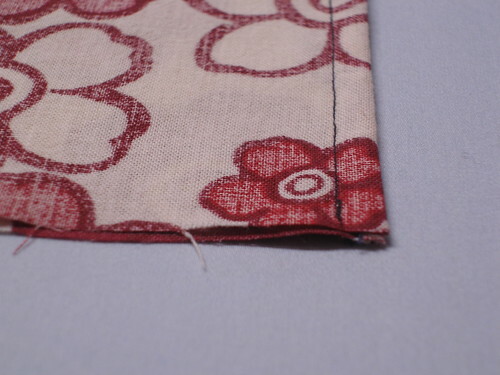 I did a nice little 1/8th inch seam thinking that I could skip the next step. You, however, should probably go ahead and do a 1/4 inch seam. -Iron the seam allowance to one side like in this nifty series of photos. Doing it this way really helps it to lie flat. -Bring the right sides together and iron flat. Pin. 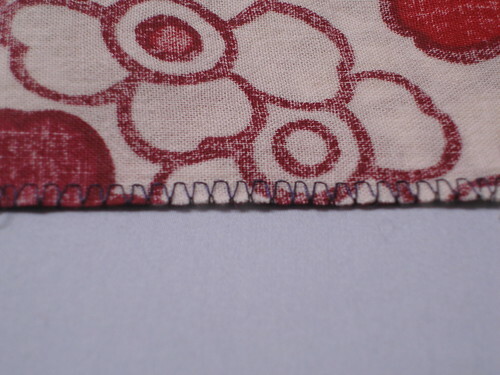 -Sew another 1/4 inch seam, enclosing the first seam allowance within. -Hopefully you don't have a bunch of stubbly threads hanging out the right side of the seam. Option 3- Straight Stitch + Zig Zag = Squint Your Eyes and It Kind-of Looks Like it was Serged. OK, it doesn't really look like it was serged, but it isn't going to fray all to hell. And it works on any type of seam (unless you'll be needing to iron the seam allowance open). -Run a straight seam. I did a 1/4 inch, but it really didn't need to be that big. 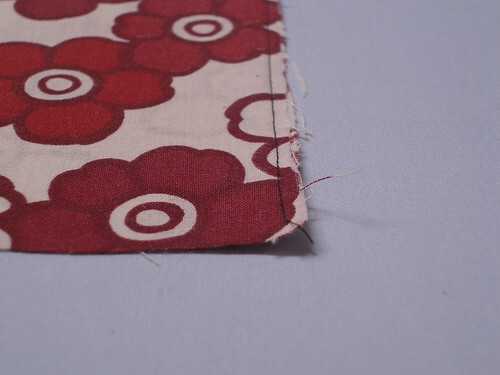 -Inside the first seam allowance, run a fairly wide zig zag seam, letting the right edge of the stitch fall off the right edge of the fabric. 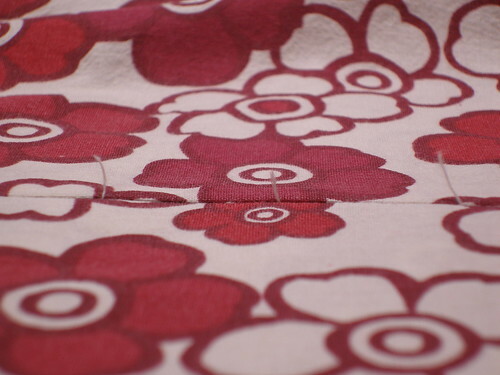 -The fabric will curl on itself just a bit as you sew, which is OK. No, really. It's OK. Awesome! Now I have to go home to see if my new machine can do the overcast stitch! I think I actually *have* an overcast stitch on my machine and wondered what I would use it for. Suppose I'll wonder no more...thanks! 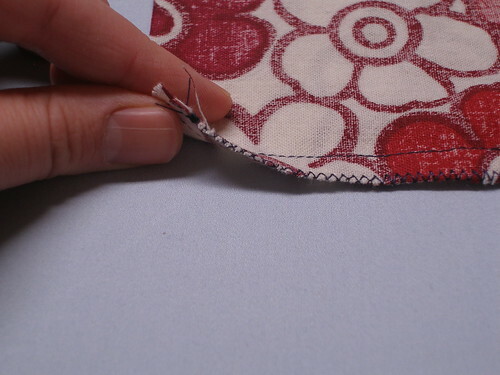 And if you DO want to press the seam open, you can zigzag the edges before sewing the seam. And one more wrinkle on the French seam: Do it backwards of the way you did, so that the sticking-out part is on the outside, iron it flat and edge-stitch it down, and voila! a flat-felled seam. Wendy, I'm so glad you're "back" . Although I don't sew (wish I knew how to but I don't), I was excited to see that you had posted again. I've been coming back every day to check (except when we were camping this weekend) and was having slight withdrawal symptoms. Keep up the good work!!! Renee & heather jane, I hope you guys have that stitch. It's pretty handy (and very satisfying). Kathi D, great point about the zigzags. 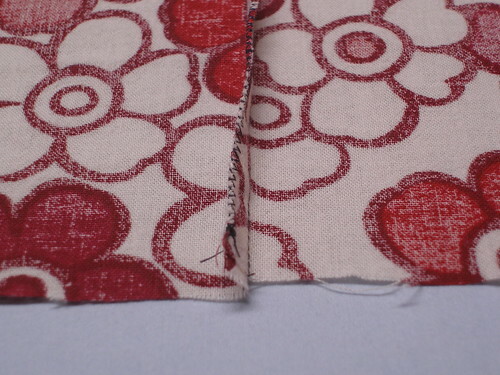 And the flat-felled seam suggestion... fantastic! If I ever sew up some pants, I'll be sure to try it. Basically it looks like my last picture on the French seam series, just with the right sides up, and you sew that down flat, right? I bet that would have the added benefit of not having any seam allowances on the inside to irritate sensitive skinned kiddos. Thanks! I love Squint Your Eyes and It Kind-of Looks Like it was Serged. Ha. Yes, it does. So I got super excited because I found "Overcast" in my manual but all it is on my Kenmore is a zig-zag stitch at the edge :( Am I missing something?